But like I said, even though I couldn’t master the “flag” presentation I was going for, I couldn’t NOT share! This breakfast is too delicious and so perfect for a holiday morning. 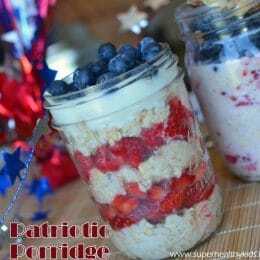 Now you COULD possibly get the layered look by chilling the oats all night separate from the berries so the oats are thick enough not to be runny, But then that kind of defeats the idea of grabbing it out of the fridge and eating. Plus, combining the berries while it sits overnight taste so much sweeter. 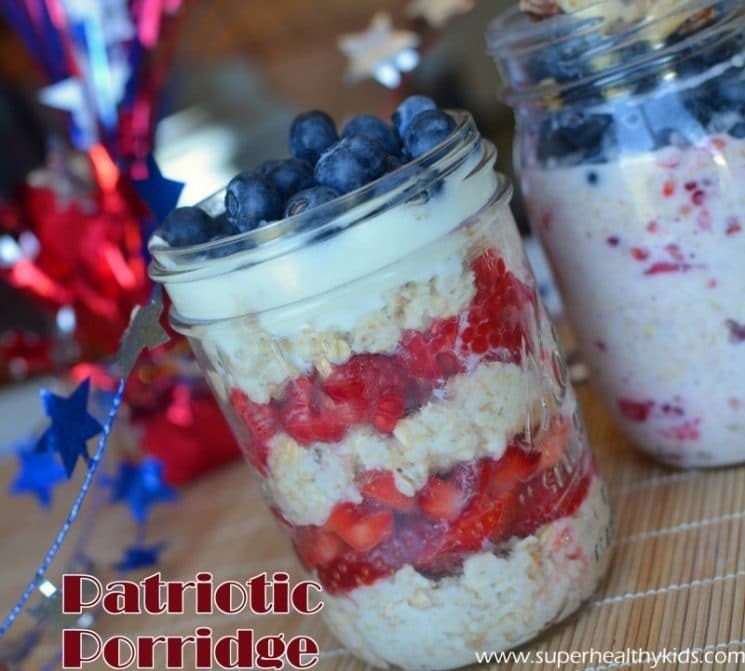 If you want the layers, chill your oats mixed with the liquid for 12 hours. 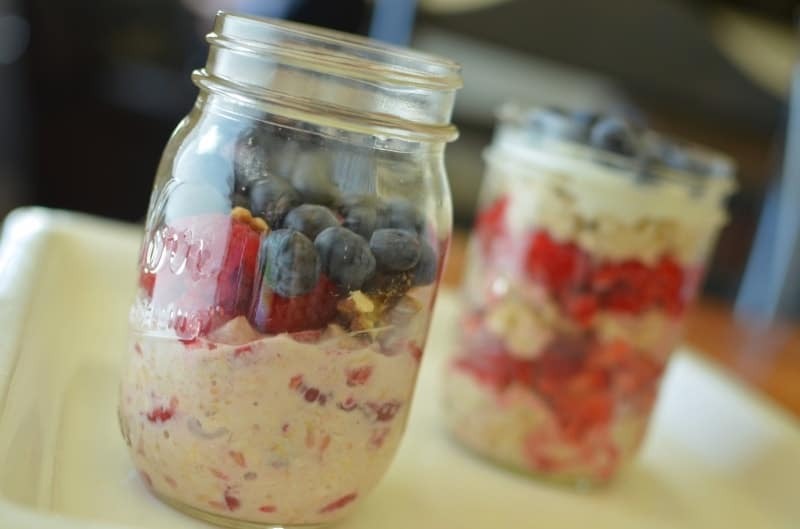 If you want the fruit to flavor your oats, divide everything among two jars and chill overnight. Extra add-ins.. We also put coconut and walnuts in one of our jars. The key to making this sweet and super healthy- is loads of berries!! 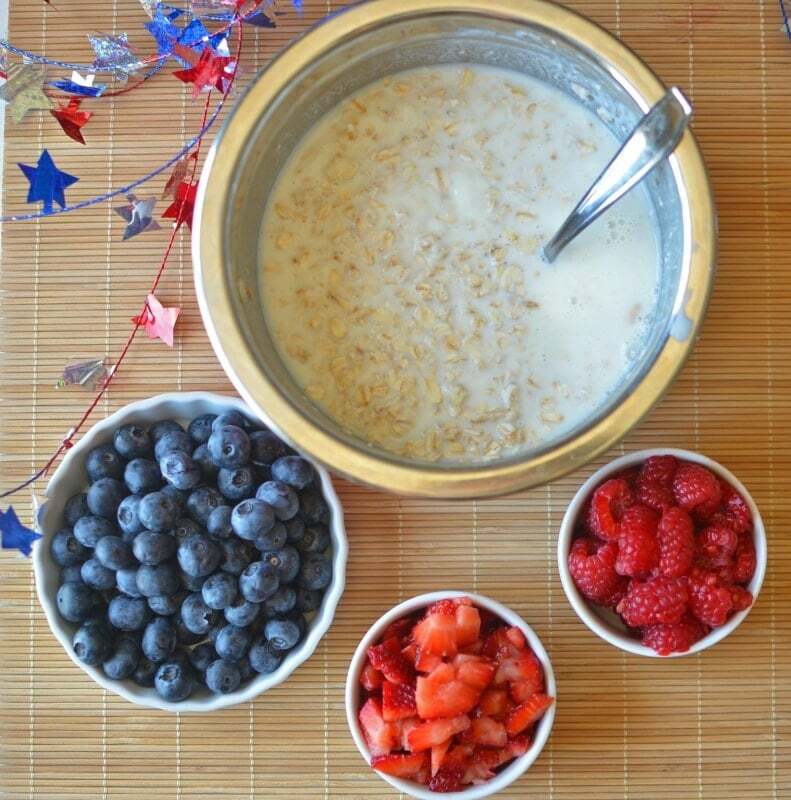 Bonus- we have our fourth of July Meal plan posted in our member section if you want more ideas!! Check it out! 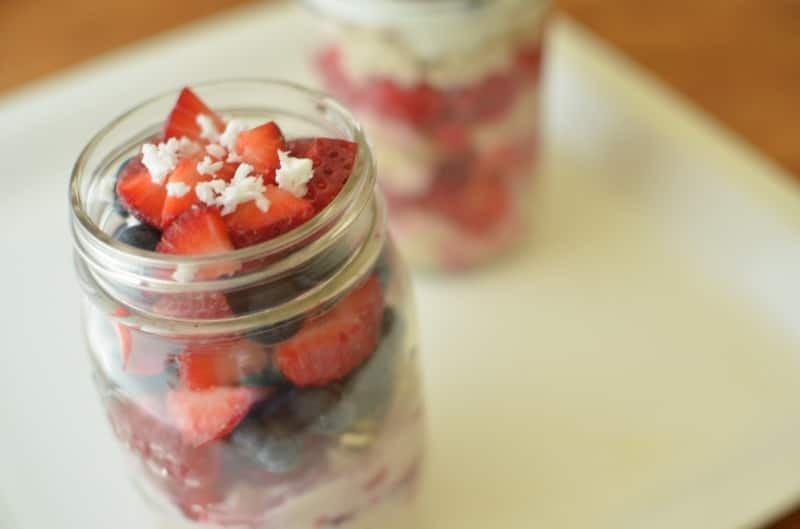 Divide all ingredients among 2-4 jars (depending on their size) and chill for 12 hours! You do NOT precook the oats! They are just plain, dry oats.. any type. 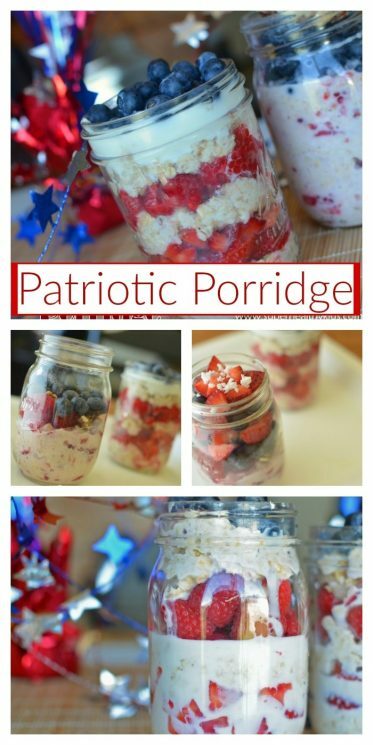 This looks awesome, oats and fruit is a must in my world, but never thought to add coconut and walnuts. That’s my take away, Thank you. Thanx for showing the “real” photo, too! Can’t wait to try this!! I can’t express how amazing that looks! This just looks so yummy. Porridge is my stable diet to start the day. Never thought to add the 1/4 cup plain or vanilla yogurt. Appreciate your kind thoughts on gluten free porridge as my wife has celiac disease. 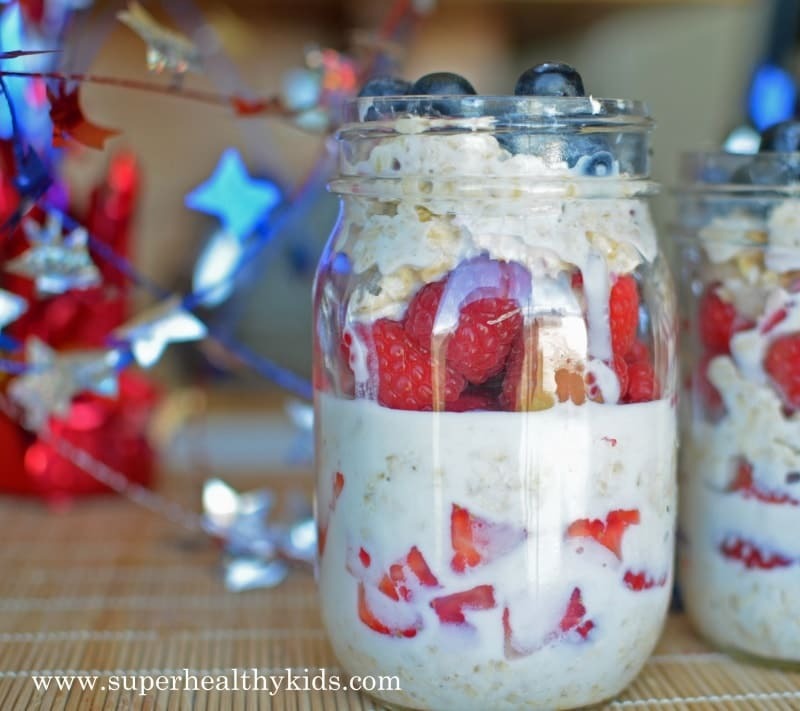 Can you use steel cut oats? Yes Julie- you can use any oats,and they should soften up overnight just fine. Last time we used steel cut oats we used half the suggested water and cooked until absorbed then proceeded with the recipe. It was just right texture wise and we prefer them now compared to quick or old fashioned oats. Thanks Jessie- We’ll try it that way! This looks awesome! Is it served cold? Yes Tara- Cold- it’s different, but yummy! what brand oatmeal do you use? what are your thoughts on quaker oats? I can’t wait to try this! Which brand of oats do you use? What are your thoughts on Quaker Oats brand? So the oats are cooked before? Can you use frozen fruit? Should you thaw them first? In the wi tee, I have lots of frozen but not a lot of fresh fruit. I can’t wait to try this. It looks reallly fun too, so I think my kids will get into it. I would thaw the fruit first Amanda- but yes, you can use it. Kelly- I’m not picky about brands. It seems like any brand just has the one ingredient oats. Our oats are actually a non-brand thing I buy in 50 lb bags at a local canning warehouse. But, in my mind- oats are oats (when they are just oats). I’m of course not talking about flavored oats- just regular stuff. How long would you say these keep? A day or 2? These would be great to prep ahead! I have done them up to a week out with no ill effects. They appeared they could go longer.